Our health is related to the places where we live, learn, work, worship and play. Adverse social and environmental conditions in neighborhoods contribute to social isolation and a lack of social support which can exacerbate stress, anxiety, depression and other behavioral health disorders. Globally, individuals who are less well-off have shorter life-expectancies and experience more mental and physical health problems than affluent individuals. These health disparities are a clear social injustice and highlight the sensitivity of health to the social environment. This is known as the social determinants of health. For the benefit of the population, it is important to consider, not only access to care, but the powerful social and economic conditions that make people ill and in need of care to begin with. Conditions like poor school quality, insecure employment, and unsafe or hazardous housing are all social determinants that negatively impact health. These conditions are often concentrated in certain areas, with multiple disadvantages impacting the same family. Among other social and psychological circumstances, disadvantages like these are stressful for individuals and can lead to poor mental health and even premature death. Because of the detrimental impact that stress can have on our health, the quality of the social environment and security of a community are vital to overall health. The foundations of physical, cognitive, and emotional functioning are established before birth and in early childhood. Supporting mothers and young children can have enormous benefits for a lifetime. Poor prenatal and developmental outcomes are more common in low SES areas. Investing in preventative health care for pregnant women and their children, as well as, education are important steps for improving long term physical and mental health in low-resource communities. Social exclusion is also detrimental to physical health, and even more so to mental health. Poverty effects certain social groups, like racial minorities, the disabled, and immigrants, more so than others, resulting in the social exclusion of individuals in these groups. Racism, discrimination, stigmatization, hostility, and unemployment also lead to social exclusion. Social exclusion increases one’s risk of divorce, disability, illness, and addiction. While being employed generally is related to health, having a job in which one has little control, low decision making power, and rare opportunity to use his or her skills has negative health consequences. Unemployment also has negative health consequences, and these consequences begin when people feel their jobs are threatened, highlighting the negative effect of anxiety and insecurity on health. Social support and positive interpersonal relationships are vital to individual health and the health of a community as they provide emotional support, material resource, and aid in reducing stress. Alcohol and drug use are associated with social and economic disadvantage as they provide an escape from adversity and stress. Access to affordable treatment for addiction is necessary, as well as, policies that address the social and economic disadvantage that often leads to addiction. There are many communities that have limited access to healthy, affordable food. This often leads families to rely on cheaper, processed foods, clearly having a negative impact on health. Additionally, food insecurity can lead to anxiety and stress. Community health can be promoted through good transportation opportunities. 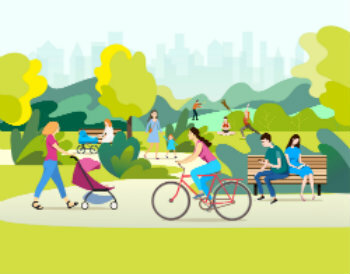 Sidewalks that allow walking and biking and accessible public transportation improve health by encouraging exercise, increasing social contact, and reducing pollution. Founded by Chirlane McCray, the first lady of New York City, Thrive NYC is a comprehensive mental health effort for New York City. Thrive NYC is closing the treatment gap that stops people from getting needed services, implementing early intervention services for children to help them get a healthy start, and changing the culture by encouraging everyone in New York City to become involved. Learn more about Thrive NYC and the network of Cities Thrive. Founded by the Mental Health Center of Denver in collaboration with the Northeast Park Hill Community, the Dahlia Campus is improving health and well-being through interventions addressing the mind, body and community. Learn more about the Dahlia Campus.